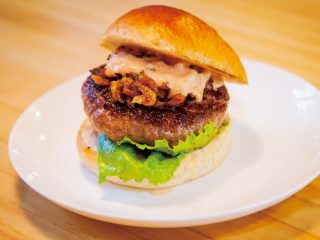 In many ways, Seolleung is the quintessential Gangnam neighborhood, a blend of business and upper-middle class family life with a dash of luxe. On Teheran-ro, officer workers turn the economy’s wheels in glassy skyscrapers, and after work, they head for the side-street restaurants and bars to blow off steam. Further back, parents shuttle kids between elementary school and the area’s new apartment complexes. Meanwhile, signs of Gangnam’s posher lineage pop up here and there, like the Lie Sang Bong Shop on Seolleung-ro-99-gil. Now based in Paris, Lie is one of Korea’s most renowned fashion designers, having dressed celebrities from Juliette Binoche to Lady Gaga. Check out his designs for women here. In nearly every way, the area seems like a paragon of the new Seoul, the one built over the last 30 years, and not a place that harbors a close connection to the deep past. But the neighborhood’s biggest feature does just that. 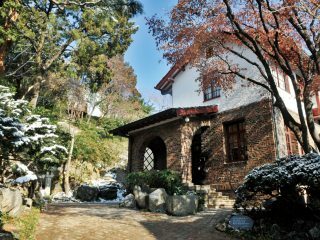 North of the station is Samneung Park (삼릉공원), where the kings Seongjong and Jungjong were buried, though the burial sites might not even be as entrancing as 90 percent of the park is taken up by thickly forested slopes and walking paths. Cherry blossoms bloom in spring, cosmos in summer, some of the city’s best fall foliage appears in autumn, and winter renders the grounds a starkly pure still life of snow, wood and stone. Together with the other royal tombs of the Joseon Dynasty, the tombs here are recognized as a UNESCO World Heritage Site. 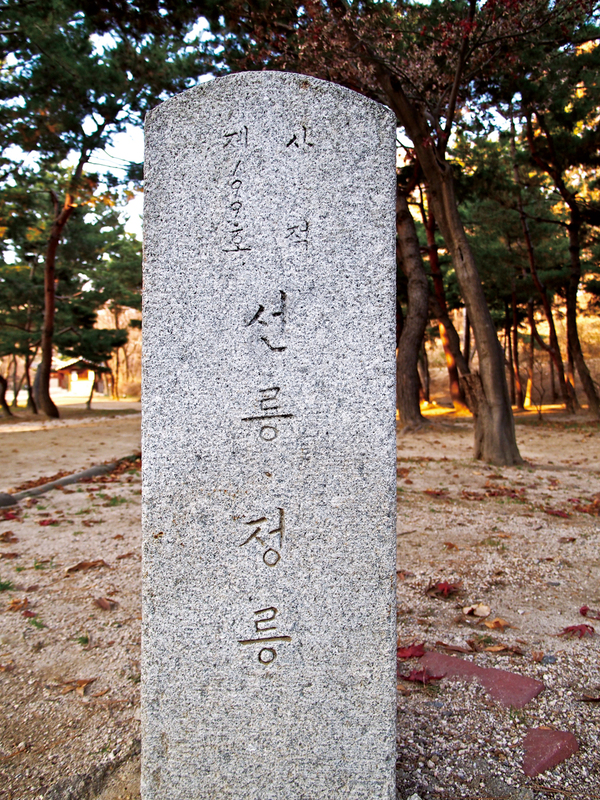 Seolleung (선릉), to the west, hosts the tomb of Seongjong, who is most noted for producing the Gyeonggukdaejeon, Joseon’s Grand Code of State Administration. Seolleung follows the characteristic pattern of Joseon royal burial sites, with a stone path leading from a red-spiked entrance gate to the main shrine. Beyond this is the burial mound, watched over by stone guardians. 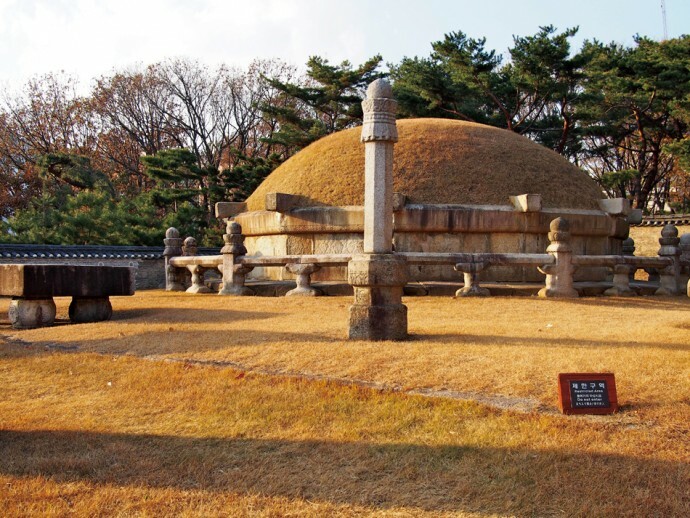 The tomb of Seongjong’s wife, Queen Jeonghyeon, rests in a copse of pines nearby. 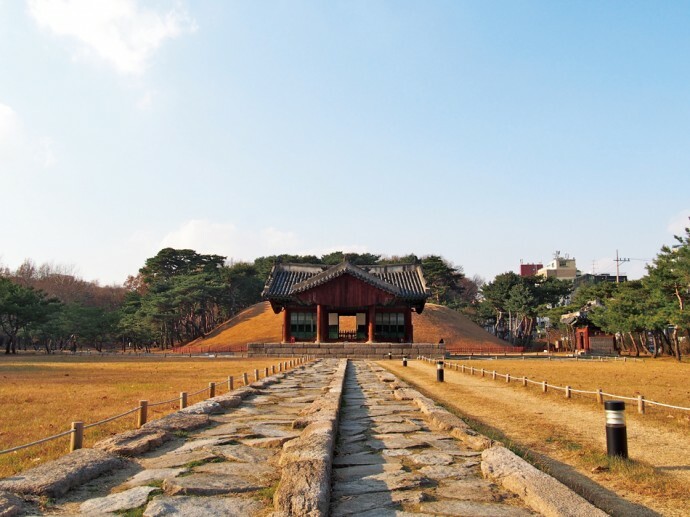 To the east, past the tomb keeper’s house and a 500-year-old gingko, is Jeongneung (정릉), King Jungjong’s resting place, following the same structure as Seolleung though on an even larger scale. Feng shui says that ideally, a tomb should face south and have a view of mountains in the distance. All that is visible southward from Jeongneung is the tops of Teheran-ro’s glistening office towers, but those, too, seem to take the form of ridges, rising and falling like the peaks of 21st-century massifs.